We have classes for all levels of ability, from absolute beginners, through to advanced and competition levels. We offer foundation classes for younger dogs, to help with their co-ordination and training, in preparation for joining a beginners class when they are a year old. 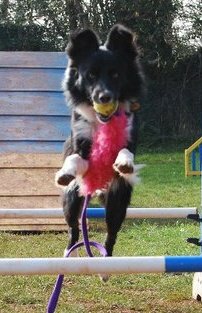 Dogs in our foundation classes do not use the jumps, or do anything else which may harm their development at this crucial stage of their lives. We also hold Puppy Focus and Play groups, where we help you to build a working relationship with your dog, through fun and play. All our classes are quite small, consisting of a maximum of five dogs – this allows more time and attention for each dog, and less time waiting around. We run daytime and evening classes on weekdays and Saturdays. All classes are payable in advance for a course of 6 classes. You can come for a taster session first to see if you like the classes before signing up for a course of 6. Please contact us to discuss the best options for you and your dog, and we will endeavour to find the right class for your dog, and at a time that suits you.